For people getting into woodworking, the router tends to be a tool that is either disregarded due to an (incorrect) expectation that it has fairly limited use, or one that is treated with a degree of mistrust. After all, holding a tool that is primarily a motor spinning at up to 20000RPM hardly fills the new woodworker with much confidence. However, those fortunate to discover the sheer brilliance of inverting the router and mounting it under a table find a whole world of possibilities opens up, and the need to handhold a screaming banshee is something that doesn’t have to be the norm of router operations. It has always been a source of bemusement to me that of all the machines in the woodworking workshop, the router table is both one of the most useful and yet is typically made rather than purchased, or is an afterthought tacked on the side of another machine. If you surveyed 100 workshops that used a router table, 99%* of them would be home made to one degree or another. The requirement for components for router tables is being recognised by a few companies, and if you bought the various components together, the resulting router table becomes an impressive machine. 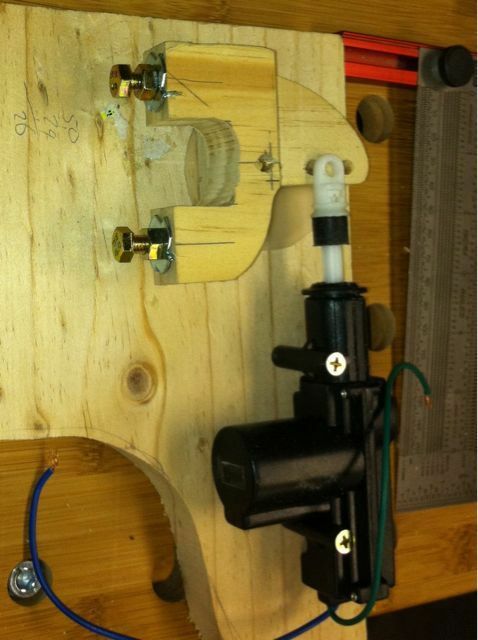 Long time readers of this site will be aware of the attempts I have made thus far to create the ultimate router table. At one stage I did look at a spindle moulder, and that may one day become part of my workshop setup, but although they can have an adapter to fit router bits, they do not have the speed range needed to drive them properly. 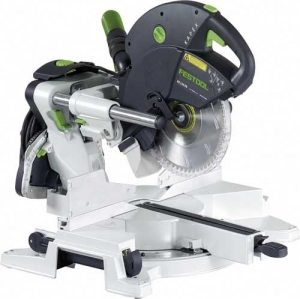 If you are intent on using router bits (which have an incredible range of functions and profiles), then there is still a place for router tables. 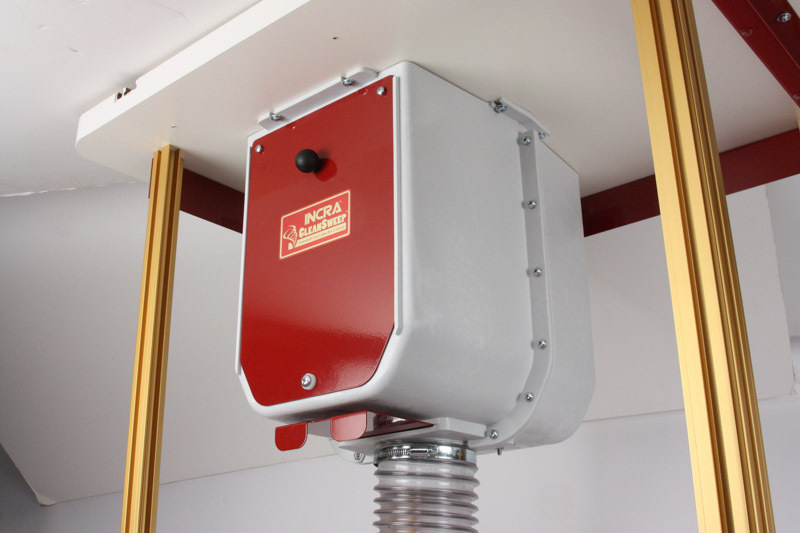 Spindle moulders get up to around 8000-9000 RPM. A router can achieve 21000-22000 RPM. There are already fences, featherboards, switches, stands, tops, and through fence, or above-table dust collection has been built in, there hasn’t been a commercial solution for below-table collection until now. Some routers dealt with this onboard, which allows the finer dust collection, but clogs with the heavier production. 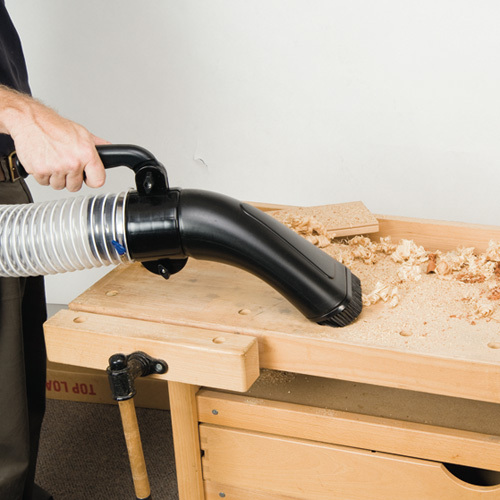 The router table would be about the second largest waster of wood (and I say that with love – using the term to mean turning the timber machined into shavings, rather than offcuts), following only the thicknesser. The jointer generates a lot of shavings, but as it only typically takes a few light passes to achieve the job of flattening a side, it doesn’t make as much overall sawdust as the router, especially when used for edging, shaping, template copying and joinery (and often all in the same project). Of course, if you have a lathe, then this jumps right into first place! So dust collection. To really handle dust production, both fine and coarse, light and heavy, you want to be using a 4″ collection system (at least!). But how do you plug a 4″ hose into a router? Simple – you don’t! Instead, you can box the entire router in, and collect not only everything that falls under the table, but also draw air and dust from above the table as well. 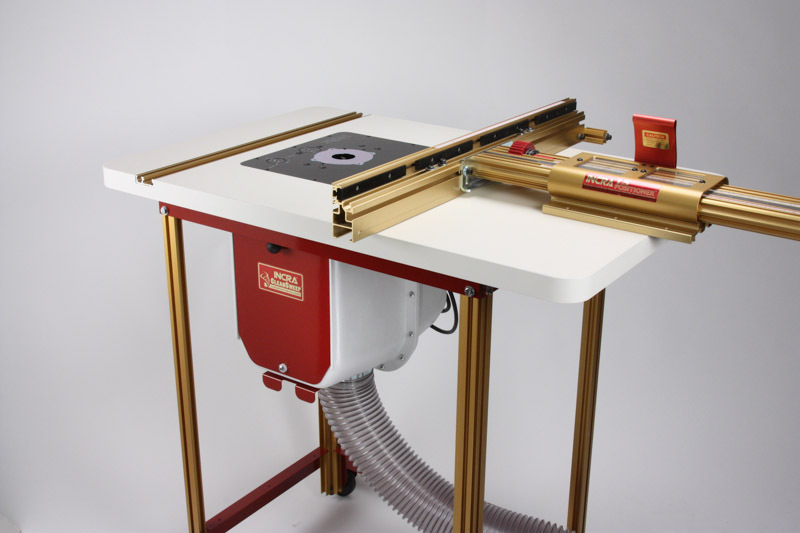 Given so many of the improvements and refinements for the router table are Incra, it would come as no surprise that the latest improvement comes from that stable as well. This is the CleanSweep. 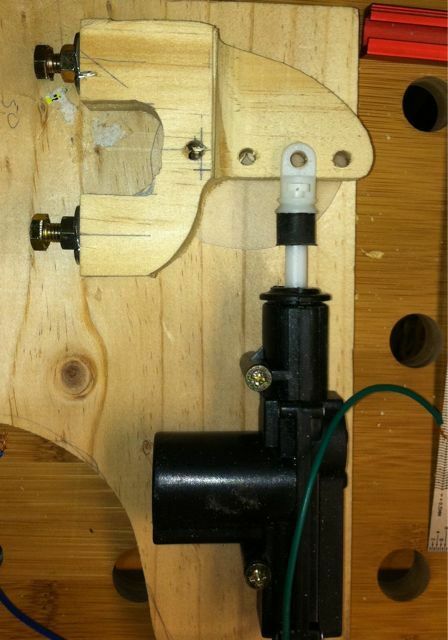 It attaches to the underside of a router table, and surrounds the router completely. At the base is a blast gate leading to the 4″ connection. 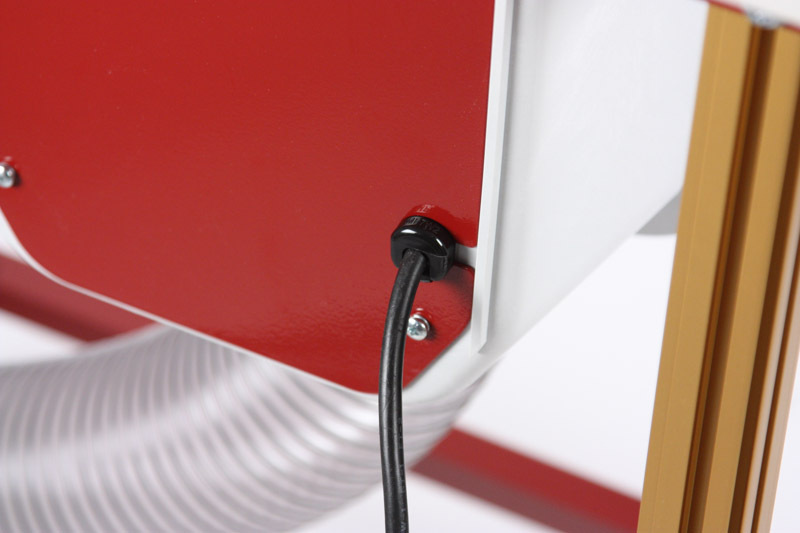 The rear door has a clip to secure the power cable, minimising dust leakage. The front door is also steel, and is on a very simple, foolproof (and fault-proof) mechanism – dropping down to allow access. I know what the CleanSweep looks like in the photos – a bit of a box. However, what you get in practice is significantly more spacious than what appears in the photos. It is designed with a specific purpose in mind, and is well constructed. You get to appreciate that during assembly. My current router table (not pictured!) has the Incra frame, the LS Positioner fence system and the cast iron top, and although now very functional still feels unfinished. You may be concerned about dust being drawn down, past the router, but let me reassure you on a couple of points. Firstly, and speaking from experience, the only time I have had dust issues with an inverted router is when I wasn’t actively collecting dust, and the MDF (particularly) got into the switch and the plunge shafts (and bearings & gears of the height winding mechanism). When collecting, especially with 4″, I have had no reoccurences. Secondly, the cooling for the motor is often on top (and therefore underneath when the router is inverted), and will get very little dust in (if not sucked immediately away). Thirdly, although the air can get a lot of dust entrained into it, overall the amount of relatively clean air that the router is exposed to is significantly higher than times it has to deal with dusty air. 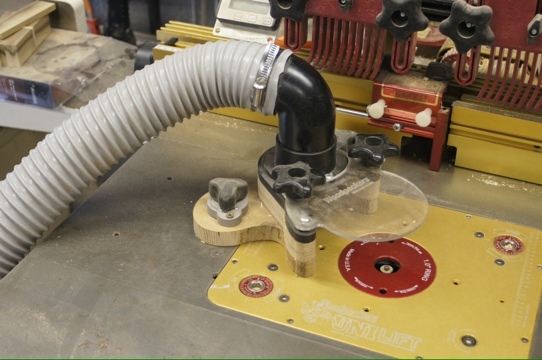 If the router table is flat, it is very easy to attach the CleanSweep directly to the bottom of the table. If not, then some infill can be made with MDF. It doesn’t have to be a 100% tight seal- the 4″ system will still create a decent degree of negative pressure irrespective of a few gaps. I haven’t any pictures (yet), but I have checked the CleanSweep on the bottom of the Triton Router Table, and I am very confident it can fit with some infills. For any infills, you can add space filler, but it really is messy stuff. On the Triton table, the CleanSweep will block the sliding table, but I never used it in that fashion anyway. It was always a much better option to use the sliding extension table if you want that function. 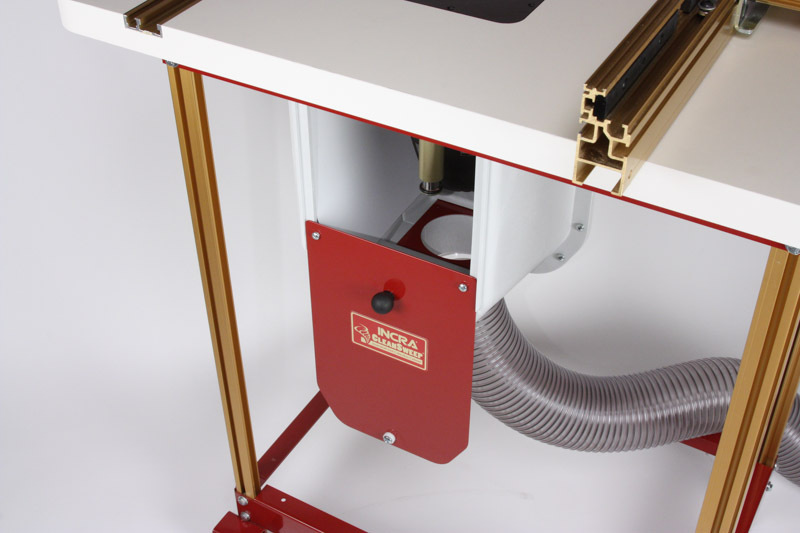 So if you have an existing router table (Trition, homemade, or even just a wing on a tablesaw), the CleanSweep is a stylish and functional upgrade that will significantly decrease the amount of uncontrolled dust that your router table will produce. 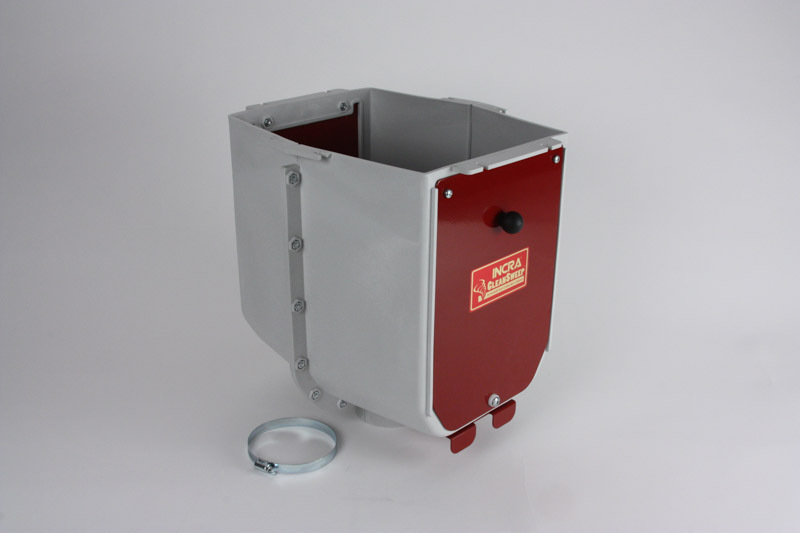 Available (as with all the other best router table upgrades!) from Professional Woodworkers Supplies. Had a look at the router table today. It has been quite a while. I was thinking of actually getting out the video camera and doing something else that hasn’t happened in a long, long time- actually produce a podcast. But before doing that, thought the router table deserved to have the intended dust extraction finished. 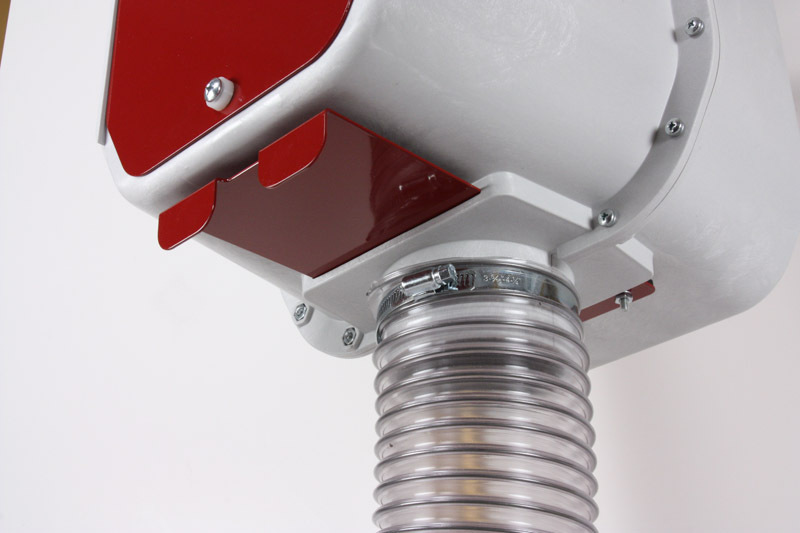 Outside the router table, there is a 4″ dust tube, connected to a blast gate and from there to the extraction system, ready to go. The other end- well, that is what needed to be connected up. Inside the router table, directly below the router there is a dust port (tablesaw dust hood) built in that has been emptying dust into the lower storage compartment, because it hadn’t been connected up. The lower compartment is storage, not dust extraction. 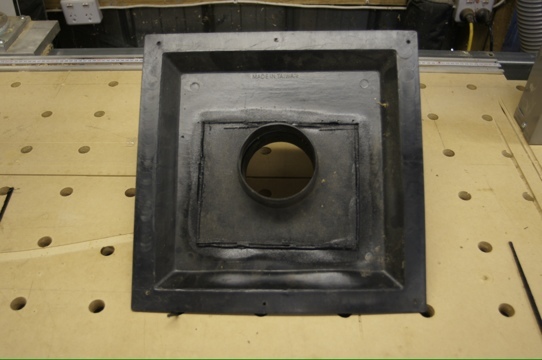 The original intention is for a tube to be connected to the extractor, providing negative pressure in the router compartment, drawing air (and dust) in from the routing area, and in through any other gaps, such as around the door that leads to the router compartment. The door is a necessary evil- I still need access to the router itself for speed changes, and router bit changes (I prefer that over using a router bit extender). So with a large holesaw drill bit, I cut an opening large enough for the dust hose, and hose clamp. Some 4″ hose was connected to the underside of the port extracting from the router bit compartment, and left sticking out. 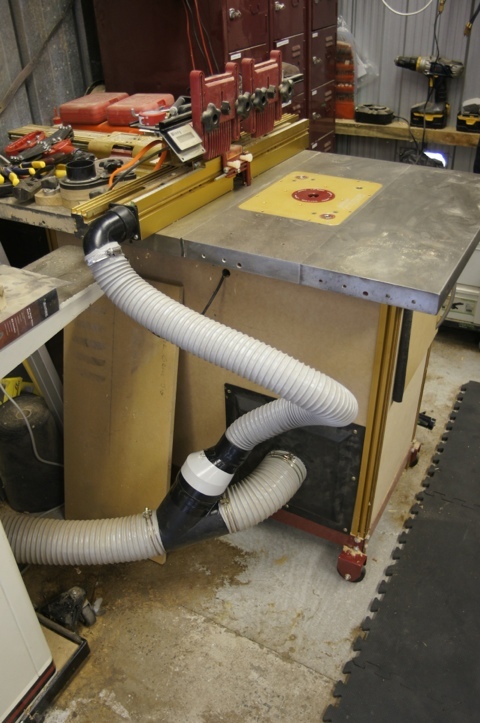 Now I planned to use a spare tablesaw dust hood I had on the side of the table to connect the extracton system to (it is a bit overkill, but it is what it is), but how do I connect the hose on the inside? So I took a second hood (a smaller one that I had originally cut down to make a bit of a vac sweep), trimmed off the remaining 3 sides so it could fit to the inside of the large hood. To join the two together, I chose (not glue, super or otherwise, not screws or bolts, nor tape, double sided carpet tape or duct tape, but) to plastic weld the two together. This is pretty easily done, so long as it is thermo-plastic, and not thermo-set plastic. The difference? One melts with heat, the other doesn’t. Seeing as the most common form of welding is to create a molten boundary between two materials so they fuse together, this can be equally applied to plastic as metal. 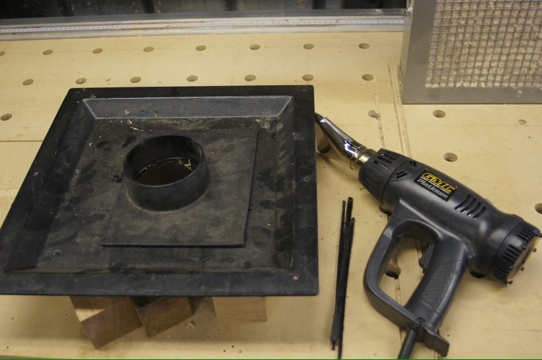 The heat source doesn’t have to be achieved by shorting out a high-amp power supply when welding plastic (unlike welding metal), you only need a heat torch – hot air is more than sufficient. This isn’t of course your run of the mill hair dryer – 600 C might create a bit of an undesirable hair style! These are similar to paint strippers, and in this case that is what I used. I didn’t have any filler rod, but it seemed to work out anyway. So with a scraper to push the material together as it melted, the blower set to 550 – 600C I welded all round. The result seemed plenty strong enough although I did get a bit of distortion in the dust hood where I got it a bit warm! 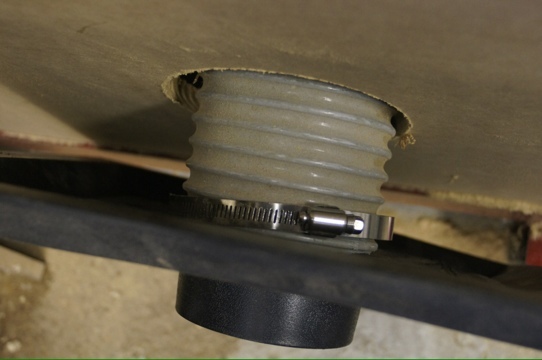 Once done, the tube sticking out of the router table was shortened to final length, then another hose clamp put on to attach it to the new attachment point on the inside of the hood. This was then screwed to the side of the router table, and connected to the dust extraction system. A Y section was added so I could draw some pickup from the router fence, or the free-routing mount. I used my standard trick of a plumbing connector to connect the 2.5″ hose to the 4″ system. I used duct tape to hold it together. Well actually in this case it was Gorilla Tape. First time I’d used it. And I thought standard duct tape was strong and sticky. Gorilla tape is quite amazing! So now the router table is connected in, and another long standing job is finally out of the way. As far as dovetails are concerned you’ll have to wait to my next post or so! One hidden benefit of using stormwater pipes for your dust extraction system is that you can reuse it for other tasks, such as stormwater! With the upgrade of the dust system recently, I have a bit of left-over stormwater pipes. 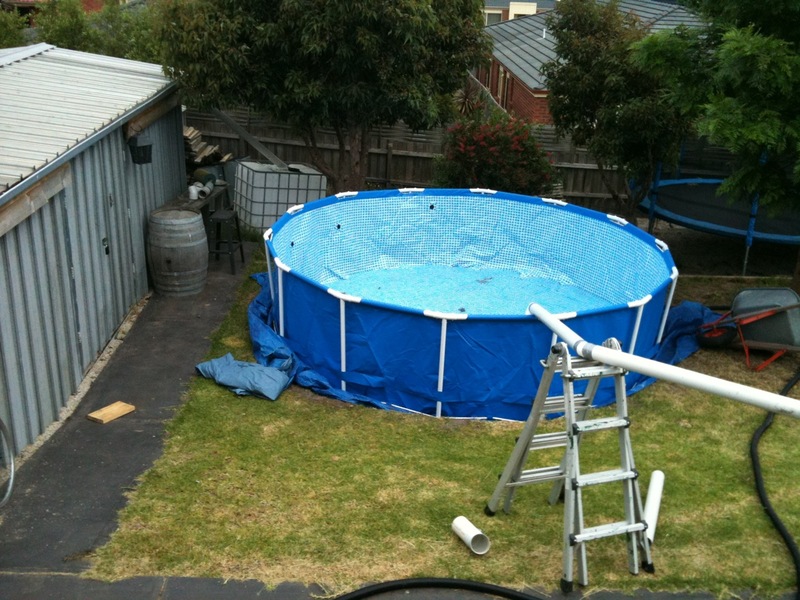 Now with the acquisition of a new pool for the little one (well that is my excuse, and I’m sticking to it! ), I need to fill it. Under the current water restriction relaxation, I could apply for a permit to use mains water. Or buy a load (costing anywhere between $250 and $600 depending on your supplier). Or I could just use rainwater. So by diverting some of the downpipes to the pool, I’m hoping to make a bit of a splash 🙂 With the reported weather for tonight, and the next few days I had some motivation to rig up the temporary run. 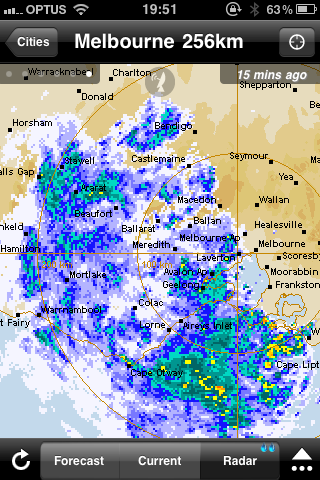 Unfortunately, looking at the rain map it managed to miss us altogether….at least this time. Disconnected the original downpipe – this one collects from the 1/4 the main roof, and 1/2 the 9m carport – a fair amount of water passes through this junction. 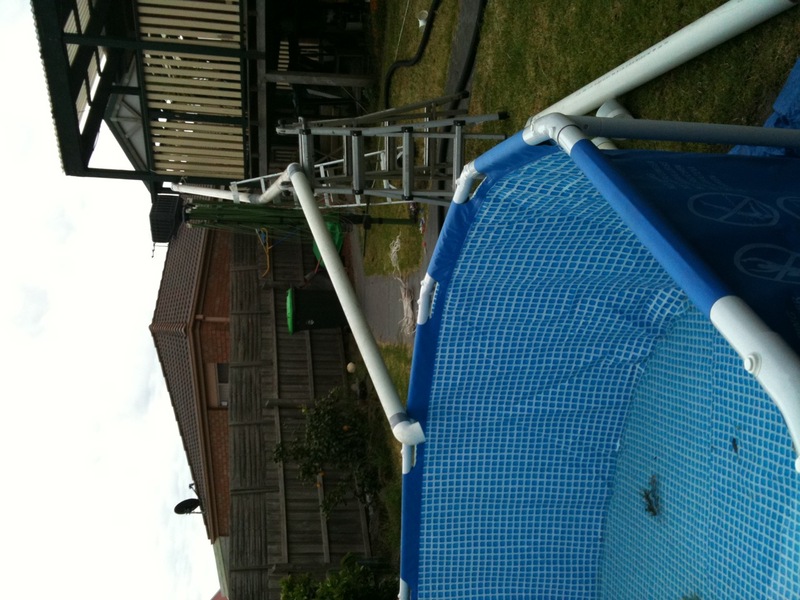 With a bit of license, some duct tape, and some flexible dust extraction hose, and a couple of ladders as supports, I was able to get the downpipe to the edge of the pool….just. So here’s hoping for a downpour! Rather keen to see if it will work (and more importantly, if my joints will hold! And in the background, I have the pallet tank taking a feed from the shed roof too. After all the heavy duty shed dust extraction upgrades, I picked up a couple of smaller offerings today that will make it easier to clean up out there. They are both new offerings from Carbatec, the first is brand new – just arrived. 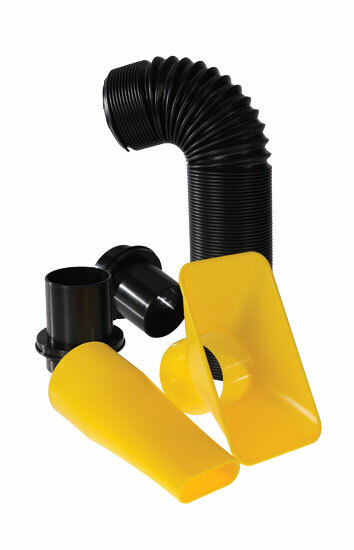 This kit is simple, and lightweight, consisting of a couple of different nozzles, and an accordion hose that holds its shape as set. 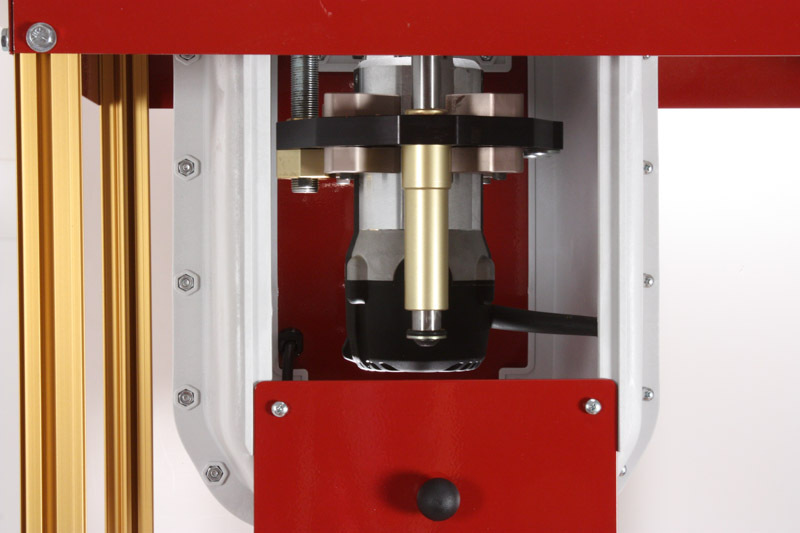 So it can be coiled around the machine to place the nozzle just where you want it. Simple, and reasonably priced. I’m thinking the drill press would definitely benefit, and the lathe in my case. The other item I got will help when all else fails: a dust wand. 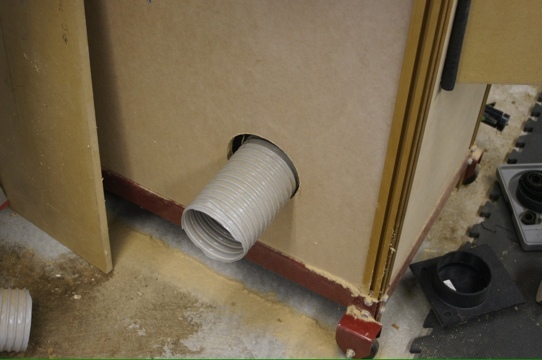 It is the way to finish off the extraction system, with the ability to ‘sweep’ the floor without having to bend or crawl around the shed floor. The kit comes with a couple of nozzles. 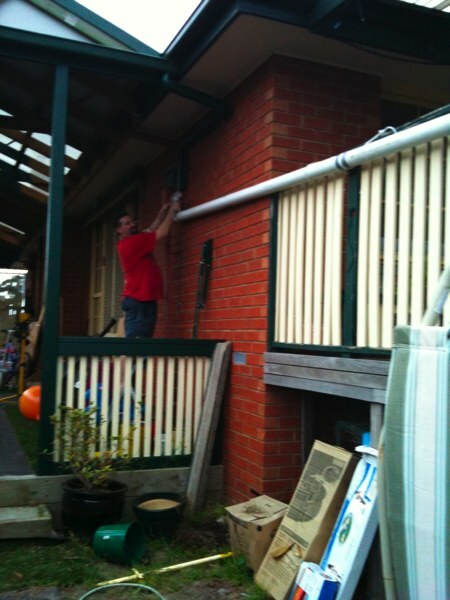 The one shown here with the full-length clear plastic duct, and a second specifically for cleaning around the tools. 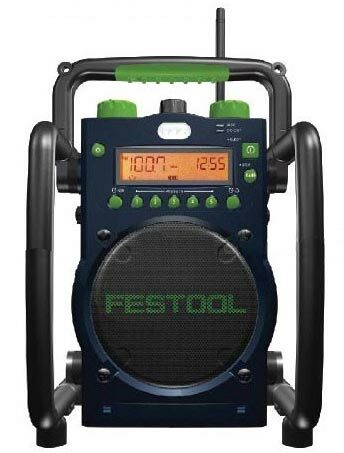 I am yet to try it out, but took the Roving Reporter’s recommendation that it worked as well as it looked. Both are currently on special for Carbatec’s end-of-year sale. I’ve started prototyping the switch mechanism to complete my electro-mechanical starter for the dust extractor. The first rocker was very basic, getting some of the initial ideas out of the head and into a product. From that, this second, still crude prototype is being developed, including additional ideas such as adjustable ends for the rocker, multi-hole positioning for the electric central lock, more scalloping both front and back of the rocker. I’m using another offcut from the thin cutting board to reduce friction between the rocker and mounting board. I’ve mounted the servo onto a board that will initially be duct taped to the starter box. The 12V transformer will be mounted to the other side of this board. It will certainly be interesting to see if this actually works! Been Spring Cleaning the shed, and funnily enough, it is actually Spring. Having the recommissioned dust system has been a big influence on this, and has been very beneficial. 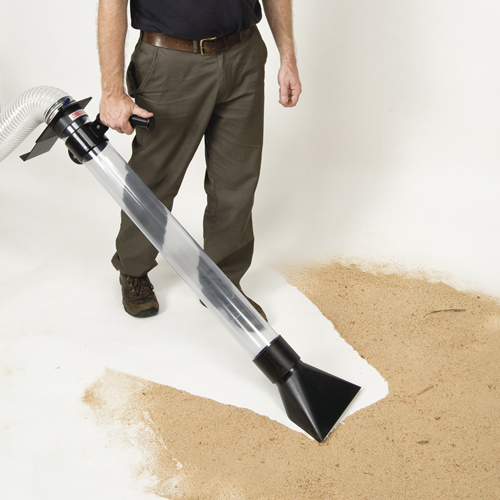 The combination of the Carbatec dust ducting kit, the Rockler blast gate mounts, and the flexible concertina hose from Carbatec has made for a system that is very suited to shed cleanup. 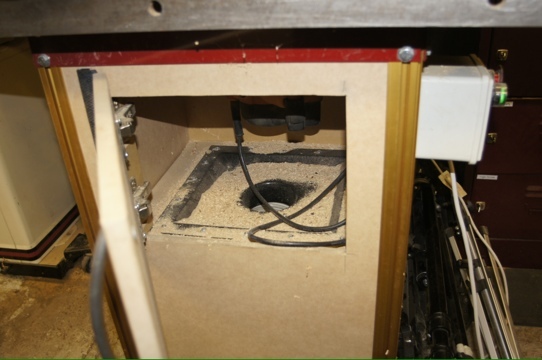 It has also been working well for the bandsaw and tablesaw – it will be interesting to see how it works when I try some jointing and planing (the most sawdust intensive operations). It has included a significant sort out of the wood stores in the shed, and a bit of a realisation that there is quite a bit of value in timber out there. Unfortunately there is not enough in that collection to substitute it all for what I’d actually like to replace it with (yet) – a Festool Kapex 120 from Ideal Tools.